Boats are used by people for both work and pleasure but are not always regulated properly. Although most boaters take safety seriously, some do not. Boat and jet ski accidents a commonly caused by collisions with another craft, a submerged object, or the wake of another boat or large wave. 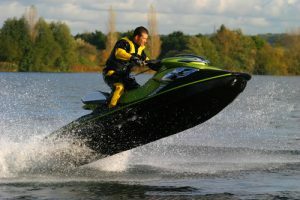 If the operator of the boat or jet ski simply pays attention, most accidents can be avoided. Both federal and state laws generally apply to boating accidents, depending on the extent of the damage and injuries. When a boating accident occurs, those who are boating for leisure may be covered by different liability rules than are those who are injured while boating for work. Depending on the circumstances, the operator of the boat or jet ski may be fully at fault, partially at fault or not at all at fault. If the boat you are on crashes into the considerably large wake of another boat or jet ski, and the operator of that craft fails to warn you, then it may constitute negligence on his or her part. Conversely, if another boat crashes into the one you are aboard, it may be the other operator’s fault entirely, or the blame may be shared. If you are injured, or if a family member has suffered a disabling injury or death in a boating accident, it is important to seek legal advice as soon as possible. There are numerous factors to consider, including the operator’s conduct, the presence of proper safety equipment on board, and whether or not workman’s compensation is available. No one expects to be involved in boat and jet ski accidents, but when it happens to you, you deserve monetary compensation for pain and suffering, medical bills, and loss of wages. At Thurswell Law, we have been assisting Michigan victims of boat and jet ski accidents, and their families, with unsurpassed success. Call us today at 248-354-2222 for a free, no-obligation consultation. No fee unless you collect.